Performance 2.0 series lockers hold up to 800 lbs. and wall cabinets hold up to 100 lbs. 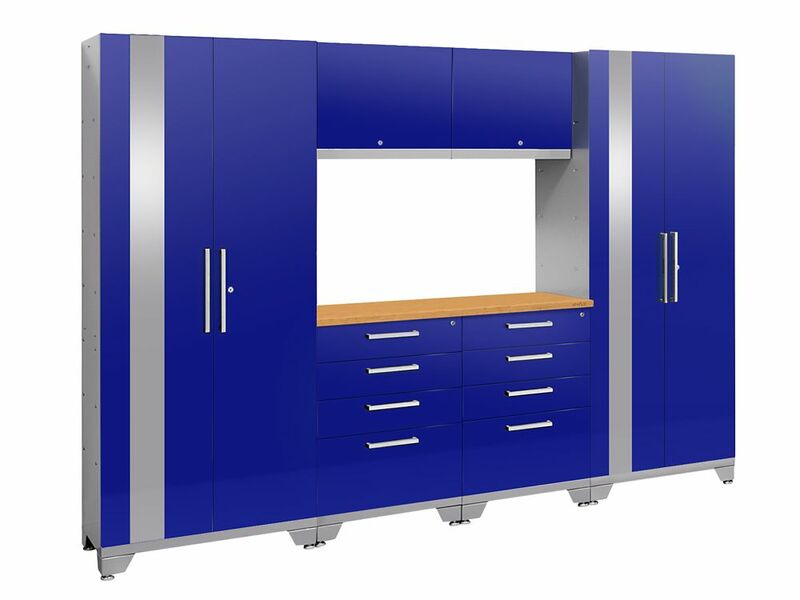 Performance 2.0 72-inch H x 108-inch W x 18-inch D Garage Cabinet Set in Blue (7-Piece) Get all those cables, decorations and gardening tools off your garage floor and into NewAge' newly redesigned, Performance 2.0 Series modular garage cabinetry. These cabinets are built to last with their fully welded, 24-Gauge steel frames and fully lockable, double walled doors. Our configured sets are shipped with adjustable steel shelving; easy-to-grab stainless steel handles and height adjustable levelling legs that accommodate uneven garage flooring. The manufacturer's limited lifetime warranty gives you the insurance that your cabinets will look great for years. Performance 2.0 72-inch H x 108-inch W x 18-inch D Garage Cabinet Set in Blue (7-Piece) is rated 3.7 out of 5 by 3. Rated 5 out of 5 by Rick from Exceeded my expectations.. Exceeded my expectations.. Rated 4 out of 5 by Cory from Good product Product came packaged nicely. Well wrapped and in perfect condition. Easy to setup and install. Good quality. My only complaint would be how the workbench attaches to the under cabinets. There is no solid beam or attaching points. It simply screws into the thin sheet metal, so if you were to lift up on the work top the sheet metal flexes and it's not a solid connection. The LED worklight does not have predrilled holes and the screws would stick up into the bottom of the cabinet above, so I used 3m strips instead which did the trick. But the light mounting seemed like an after thought. All in all a pretty solid product. Rated 2 out of 5 by danmich from Two Cabinets were damaged!